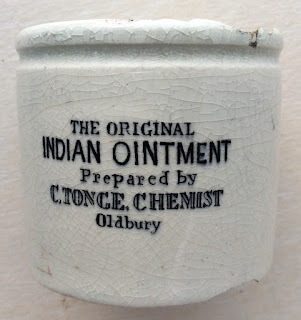 This page shows the 'Indian Ointment' pots originating from Oldbury. 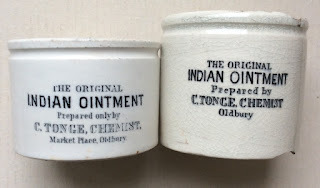 Two new pots were dug in 2012 close to Leamington Spa bearing the 'INDIAN OINTMENT' name, as prepared by C. Tonge, Oldbury. Charles Tonge was born in 1818 in a small village in Nottinghamshire. 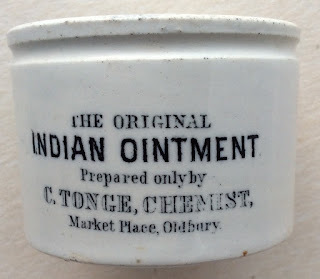 He is recorded in 1851 in the census at Birmingham Street Oldbury as a Chemist and this was unchanged until 1865 when he was recorded at Market Place, Olbury as a Chemist & Printer. He died in Olbury in 1898.
book produced by Messrs. Houghton & Priestley. Further information on these pots will be provided in the update section of the Pot lid book.